Welcome to Los Olivillos Mountain Retreat website - situated in the Sierras de Tajeda, Almijara & Alhama National park in Andalucia. 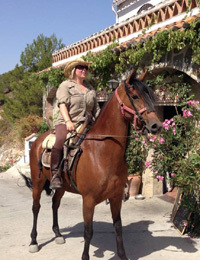 We specialise in exclusive tailor made holidays for those who that enjoy peace and tranquility whilst exploring the beautiful region of Southern Spain either on horseback and/or with one of our walking guides. 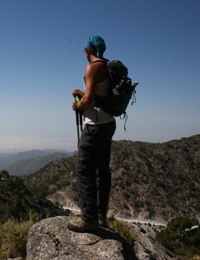 We are surrounded by stunning scenery - mountain peaks, waterfalls, moorish trails and local wildlife including golden eagles, egyptian vultures, harris hawks, red kites, ibex (mountain goats) stone martens, foxes, badgers and wild boar not to mention an abundance of flora and fauna and fragrant herbs. 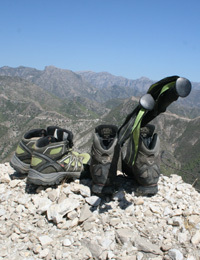 If you are staying locally on holiday, We also offer daily rides and hikes. 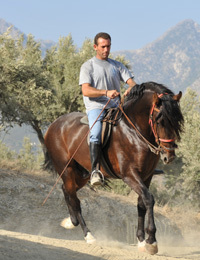 Los Olivillos is a working olive farm British owned and run for the last 11 years catering for riders and hikers of all abilities. During your visit you will experience stunning views from our terrace down to the blue seas of the Mediterranean at the same time as enjoying the true wilderness of Andalucia.